1. It’s spelled eMbryonic, not ebryonic. They got the most important word in the article wrong in the title and in the first word of the title no less? Are you kidding me? A federal appeals court reversed a lower court’s ruling to halt federal funding of research involving human embryonic stem cells, voting 2-1 that the policy does not violate a 1996 law. In August, Judge Royce Lamberth of the U.S. District Court for the District of Columbia banned the funding policy, potentially derailing scores of projects looking into the causes of diseases like Parkinson’s, Alzheimer’s and cystic fibrosis. President Barack Obama had sought to deliver stem cell research funding from constraints imposed under the Bush administration, but Lamberth ruled that the policy violated the Dickey-Wicker Amendment, aimed at stopping the destruction of human embryos. Dickey-Wicker proved to be a sticky wicket for both plaintiffs and defendants when the appeals court issued a temporary stay of the Lamberth ruling. Obama’s policy allowed the use of stem cell lines derived from frozen embryos from fertility treatments that were no longer needed and donated according to stringent ethical guidelines. The plaintiffs in the lawsuit, James Sherley and Theresa Deisher, argued that the Obama policy violated the Dickey-Wicker rules. The Obama administration appealed the decision to the D.C. appeals bench. In a 2-1 ruling, that court overturned Lamberth’s decision. 4. “More radically, Dr Doris Taylor, of the University of Minnesota, has been using stem cells to actually build new hearts in the laboratory. She has achieved this with a rat heart by stripping it of its cells, then re-populating the resulting perfectly heart-shaped scaffold with stem cells, which adapt into heart tissue, so that in time the heart begins to beat again. “.. the thought would be that we would take a heart, probably from a pig .. wash all the cells out, and then take your cells and grow enough of them to .. build a heart that matches your body and have it transplanted into you. That’s the home run,” says Dr Taylor. Heart disease threatens the lives of millions, but with only limited hearts available for transplant, medical science has long yearned for a definitive fix to repair or replace this most vital organ. Troy Golden, a pastor from Oklahoma, was born with a heart that would one day break. A genetic condition known as Marfan’s syndrome has been slowly attacking his body tissue since birth including around his heart and valves. At the age of 41, he had to undergo life-saving surgery, replacing valves and reshaping his heart’s walls. But his condition continued to worsen. In January 2010, he was put on the heart transplant list, but time ran out without a donor. 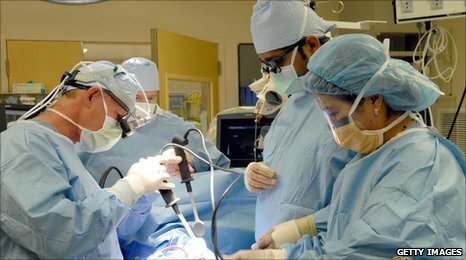 In September last year, Troy became one of the few people in the US to have his entire heart replaced with a device called the Total Artificial Heart. It’s made of plastic and weighs 160 grams and is a little larger than a biological heart. It is powered by a pneumatic pump that you carry around in a rucksack. Troy has had to get used to the non-stop sound of the pneumatic pump. But he looks and feels remarkably well and is overwhelmed by what has been done for him. 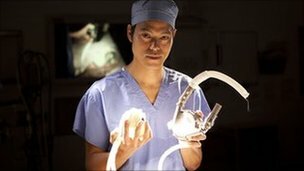 The Total Artificial Heart has done more than buy Troy some time. It has given him his life back and it has given him hope. But this is not a permanent solution. His heart’s batteries must be constantly charged, spares must stand at the ready. The risk of infection and clotting add to the constant worry. For now Troy must again endure the long wait for a donor heart, but there are other solutions on the horizon. New avenues of research are focussing on efforts to assist, rather than replace the heart. Increasingly, in patients suffering from heart failure, miniaturised pumps are being used to assist heart function. They are about the size of a cigar and are essentially plugged into the main pumping chamber of the heart to help it along. Unlike Troy’s artificial heart, they can be left in place indefinitely. But perhaps more remarkable is the fact that these pumps can sometime be removed, once a damaged heart has recovered. And it is the potential for hearts to actually recover, after having been damaged, that is being investigated in some of the most exciting research going on today. Much interest centres on stem cells because they are the closest natural thing to the body’ s spare parts and, under the right conditions, they have the potential to transform into a huge number of different cell types with specialised functions. Because of this, they can take part in the process of renewal – replacing diseased and damaged tissues. Preliminary results are highly controversial, but there is a growing body of evidence that suggests we may in the future be able to harness the heart’s potential regenerative capacity for future therapies. More radically, Dr Doris Taylor, of the University of Minnesota, has been using stem cells to actually build new hearts in the laboratory. She has achieved this with a rat heart by stripping it of its cells, then re-populating the resulting perfectly heart-shaped scaffold with stem cells, which adapt into heart tissue, so that in time the heart begins to beat again. If the clinical application can be made to work, it is a revolutionary if relatively distant possibility. For Troy and the millions of people like him for whom heart failure is a reality, this work is of vital importance. There is the very real possibility here that, within our lifetimes, scientists might finally find the cure they’re looking for. While their search for that magic bullet remedy is far from at an end, each new discovery brings them another step closer. when are they going to allow us to use stem cells for autism in this country??? I am getting impatient every treatment center I’ve called here (in the US) says they wont do it! I am having a baby in feb and want to use the cord blood for my son but when will I ever be able to? anyone know? BUFFALO, N.Y. — The University at Buffalo will receive $4.9 million in funding to conduct research on stem cells, part of a new investment in stem cell research announced yesterday by New York State Governor David A. Paterson. via UB to Receive $4.9 Million in Stem Cell Research Funds from New York State.